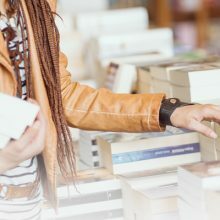 The well-known high-street retailer, Waterstones, are very much ‘pro’ self-publishing, and that means there is nothing to stop you going into your local store, introducing yourself and asking if they will stock your book. Self-published or not, any book can be accepted or rejected, so, wanting to find out exactly what they look for in a title we gave them a call. We were invited to interview the Regional Manager and Store Manager of our local Waterstones. We spent a good deal of time hammering out best practices, things to avoid, and generally ‘chewing the fat’ with regard to publishing and self-publishing. They are lovely people and very much into their books. Naturally, our focus was on gathering as much information as possible, for our authors, about how best to approach them with titles they might wish to stock. Firstly, the points that you absolutely must have addressed before you contact them are; ISBN, cover and a printed copy to present. The teams at Waterstones know what will sell and what won’t, they place very high importance on a professional cover and require an ISBN for each book for their cataloguing and retail purposes. Furthermore, the page layout needs to be good. One of the things noted by the store manager was that often, independent authors handed her books within which the text was very small. People flicking through books will often put them down again if the text is not comfortable to read. Books which have settings local or linked to the area in which the store is located can be favoured. These can be fiction as well as non-fiction; why not set your next book in your home town? You know it well, after all. Also, each store has certain leanings in terms of genre; get to know your store - look at the books that are stocked there and get a feel for how you can appeal to that market. One other thing to consider is that lunchtime, from around noon ‘til 3pm is their busiest time and so it’s better to go in the early morning or after 4pm to have the best chance of catching one of the managers with some spare time.